As someone who hates looking back, the other day I got a full blast of nostalgia while rummaging in an box tucked away in some drawer from which I dug up some old gig tickets, letters, postcards, autographs and a couple of souvenir pictures from a previous life. 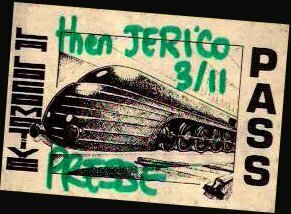 The moment I picked up a backstage pass for the two shows Then Jerico performed in a small club in Paris back in 1988, this song (about Apartheid in South Africa) I had not heard again since over 30 years ago, started playing in a loop inside my head. A band I had discovered two years earlier, while still unknown, at the legendary Marquee Club in London. And much to my surprise, I found that Then Jerico still exist, at least their charismatic singer who clearly hasn't lost any of his verve nor poise and still has it “muscle deep”. That said, however, there aren't many “ressurected” groups of the 80's who successful regained their past glory while reinventing and improving themselves along the way. The only example I could think of is Indochine of which Nicola Sirkis is the last surviving founding member. Mark Shaw probably never will, but I'm pleased to hear that he still has an audience and that he's having fun. The obvious kick it must have been to his ego didn't kill him after all and that's great news. The feeling's not gone and it's not pretending. L♥ve this song! And the Spiders From Mars. When the cold is biting muscle deep. Then you know it's gonna spread around. The prejudice lies muscle deep. And I'll take you by the hand.